The Audubon Birdcam got us thinking about different ways to remotely trigger (IR , wireless , cable ) cameras (cellphone, webcam, DSLR, point-n-shoot). After thinking about what kind of projects would be interesting to attempt with the help of a remote trigger (water splash, insects flying, etc), we decided to look around to see what’s available. After a bit of research (OK, a lot of web surfing) the interns were able to compile a list of vendors and gear which could be good matches for what we want to do. 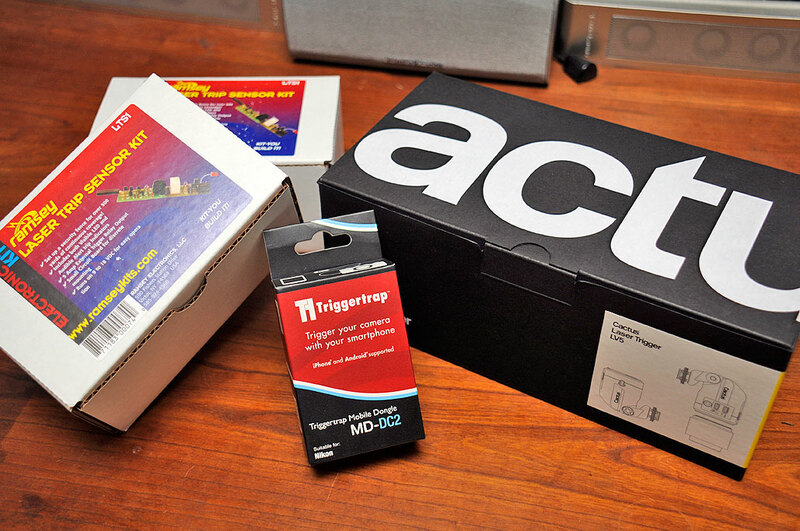 A few meetings later, we were able to pare the list down to three of the most interesting triggers to review: Triggertrap, Ramsey Laser Trip Sensor Kit, Cactus LV5. The Triggertrap Mobile is the simplest one of the bunch. The complete trigger is a dongle and cable paired with a free app (iPhone, Android). The dongle and cable let the smartphone communicate with the camera; the app does all the rest: timing, motion detection, and triggering the camera. There are a BUNCH of different trigger modes now and likely to be more when someone thinks of them. The cool thing about the Triggertrap Mobile is that when new modes are created, all the user has to do is update the app. For the DIY folks Fotoopa’s custom rig for freezing insects in flight has long been and will likely continue to be the ultimate build. We were not sure if we would be up to the task, so we decided to see if we could put something together using a couple of Ramsey’s Laser Trips Sensor kits. The kit comes with all the parts needed: the laser element, the PVC enclosure, and the electronic components to build the laser detector. It can also be adapted to use with an infrared (non-visible) laser. 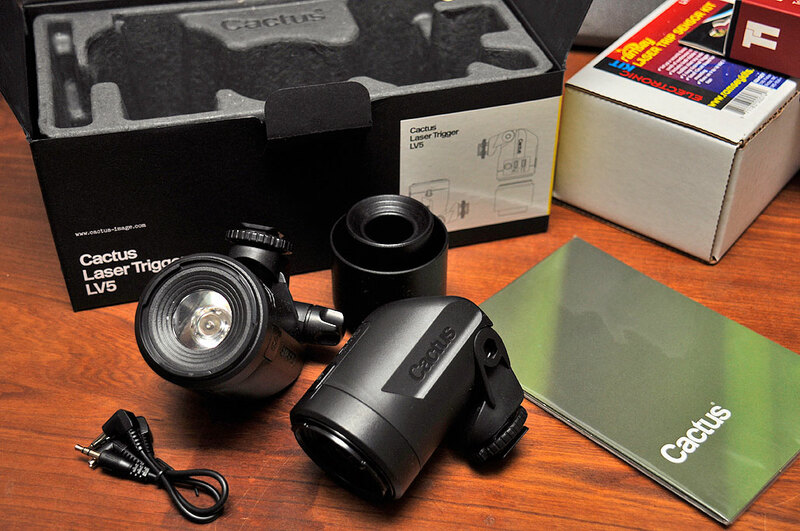 We like the Cactus LV5 trigger because it can handleboth studio high-speed photography and wildlife camera setups. The laser trigger gives us a long working distance (20 meters in sunlight, 150 meters in dark environments). Besides the laser trigger, the LV5 also has an RF trigger so it can wirelessly fire a remote flash. Also, there are many different triggering modes and delay options to further allow the user to customize the exact firing of the camera after an “event” has been detected. 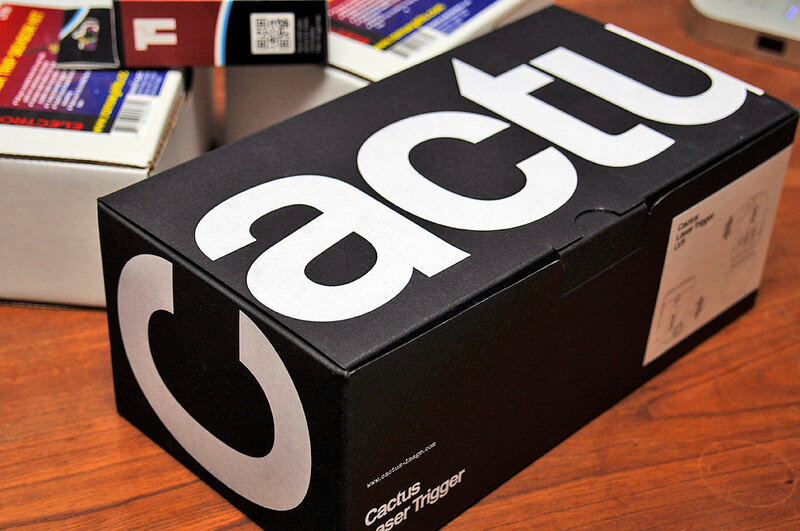 We are very excited about the Cactus LV5 and are eager to put it through its paces. It will take us a little while to run through all of these different remote triggers. However, with all of the projects we have in mind for them, we are confident that the write-ups should make for interesting reading 🙂 Look for them in the Fall and Winter.